Add Weather & Graffiti Protection (POF)--Only $29.95! Aluminum Diamond Grade sheeting is 1400% brighter than Engineer Grade, and 50% brighter than High Intensity Prismatic. 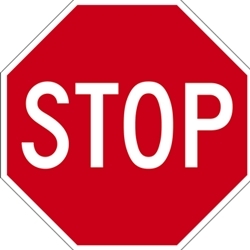 Our STOP Signs meet construction specifications for MUTCD STOP Signs. DOUBLE the working life of your Diamond Grade STOP Signs by adding 3M Protective Overlay Film (POF)! 3M’s high-tech POF protects sign faces against fading caused by the sun and harsh weather—and makes graffiti and sticker defacement damage easy to clear away without harsh abrasives.